In my fourth grade inclusion class, we started the year by studying the characteristics of literature genres. The general education teacher and I did some pre-assessments and determined that our students had almost no knowledge of the different genres. In order to address the Common Core Standards relating to the comparison of genres, we needed to make sure our students knew what the genres were. 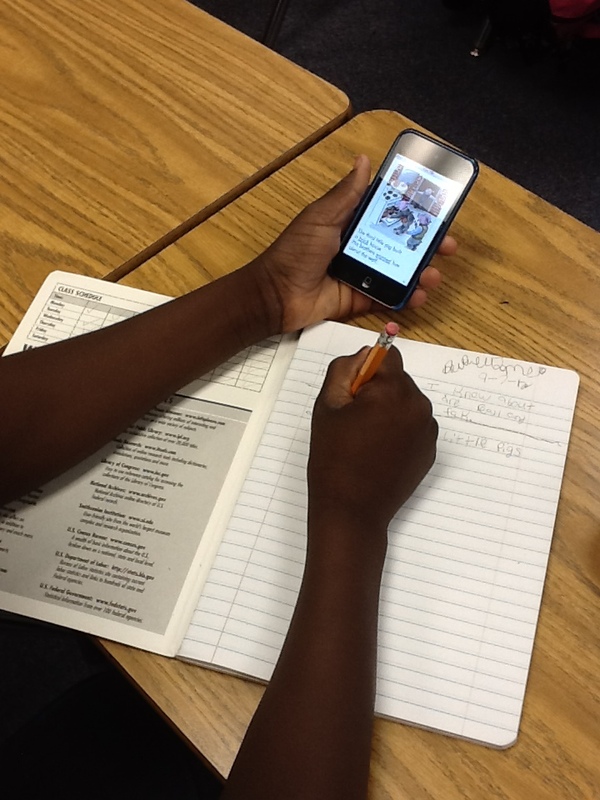 Students note-make using a Literature Genres podcast. The unit began with the students having to note-make using a podcast on literature genres. (See blog post on note-making.) With no prior knowledge of the word genre, it was easy to set the purpose for the note-making. On their side of the interactive notebooks, students were to first define the word genre. The second responsibility was to list the nine literature genres and a clue or hint for each genre. All of this information was clearly stated in the podcast. Following the note-making procedures, students watched the podcast twice. The first time just to watch. This allowed students to watch the entirety of the podcast without trying to write notes. The second time the timer was set for 20 minutes and students were reminded how to pause the podcast to make notes. They were off and running. This was the first note-making experience for nearly all of these kids. With this in mind, I stopped the timer after about 7 minutes to model my own note-making. On the board I illustrated how I would organize my notes into a T-Chart. I listed the first genre on one side and the clue for that genre on the other side. However, I also was sure to state that this was how I would note-make, not necessarily how they needed to do it. The beauty of note-making is allowing the students the freedom to create notes in whatever format is going to best help them. After modeling the note-making and answering any questions, the students fell right back into their own note-making. This was also my co-teacher’s first experience with note-making and podcasts. She was stunned at the engagement of the students. For nearly 40 minutes (20 minutes was not long enough for the students to complete the task) 100% of the students were 100% engaged in the lesson. There were no disruptions, no behavior problems, and no off task behaviors. All in an inclusion classroom with half of the students receiving special education services and during the last period of the day. We finished off the lesson with a student led discussion detailing each of the literature genres and the clues associated with them. As the teacher, I actually gave very little instruction. It was completely student driven based on the information they gathered from the podcast. Anticipating gaps in the note-making, and ensuring that every child got the correct information into the notes, students were given a grid of the literature genres and their clues to glue onto my side (the teacher side) of the interactive notebook. This also served as an accommodation for my students with larger handwriting or for those who didn’t quite get all of the notes completed. Giving students a clean copy of the notes is often an accommodation we use on the IEPs. The unit continued with a quick look at each of the literature genres using a variety of teaching strategies, trade books, and apps. Stay tuned as I’ll be posting an iLesson detailing our final performance assessment featuring Talking Book Covers later this week! Attached below is the literature genre podcast and a copy of the notes that were handed out at the end of the lesson. Genre Podcast – This is a link to my class site. The podcast is linked under the Files section of the page. It is already in .m4v file – ready to upload to an iPod.